As one of the Midwest’s leading trucking firms, we know the importance of maintaining a strong and profitable presence in our local economy. We work hard, give our drivers plenty of work and contribute to the overall nationwide economy with our transportation and trucking services for intermodal cargo across the country. And Calhoun Truck Lines is just a small part of the overall impact that trucking companies and the trucking industry bring to the American economic engine. Recently, our leading industry association – the American Trucking Association – delivered a new report that underscores the importance of the trucking industry. The ATA American Trucking Trends 2013 shows that the overall trucking industry continues to be a strong economic engine for the nation, and indicates that trucking remains the main mode of US freight transportation. Using trucks to deliver goods around the country is a mainstay of our service and one that we look to grow at Calhoun Truck Lines. Trucking companies, intermodal companies, and others trucking related services and industry-related companies employed nearly 7 million workers in 2012. Most trucking companies are small businesses, notes the report. About 90% of trucking firms operate six or fewer trucks. Only 2.8% of fleets operate more than 20 trucks. Trucks were responsible for moving nearly 70% of all U.S. trucked shipments in 2012. That’s almost 9.5 billion tons of freight last year. Those numbers show increases from 2011’s numbers. 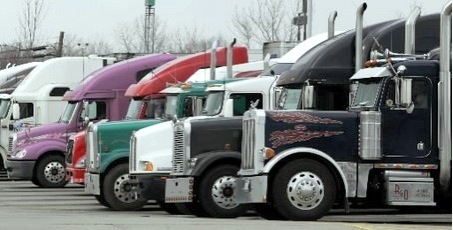 Trucks in the 6-8 class traveled 137 billion miles in 2011, almost a five percent increase form the earlier year. U.S. trucking industry gross freight-related revenues totaled some $642 billion. That’s 80% of the freight bills across US trucking companies, according to ATA. Trucking companies paid 10% more taxes in 2011 than in 2009, amounting to $36.5 billion in federal and state highway user fees and taxes in 2011. Some challenges exist for trucking networks. The ATA noted issues like our nation’s infrastructure in need of repairs, issues for supply management and logistics teams, and the continuing worry of not enough drivers to carry our fleets across the country. But Calhoun Truck Lines remains confident that we can overcome some of these challenges and continue to play a prominent role in our country’s economic future.